It's time for another book club announcement post! For this year's Flights of Fantasy Reading Challenge (which you can still sign up for! ), Rachel & I decided to team up to read a book (or a series) from a fantasy author we've never tried before. And what want to invite YOU to join us! 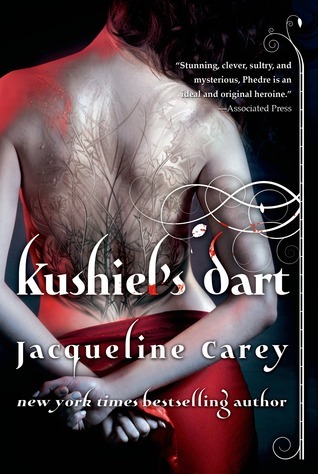 This month, we are reading our first Jacqueline Carey novel, Kushiel's Dart. Macky has actually read this series in full and really enjoyed it; it also comes highly recommended by Susan Dennard. I totally trust these two to guide me right when it comes to my reading choices, so I'm very eager to try this book out. As with our previous book club reads, there are no specific dates; you simply get the next two months (July and August) to read. Hope some of you will join us! In a kingdom born of angels, Phedre is an anguisette, cursed or blessed to find pleasure in pain. Sold to the Court of Night Blooming Flowers, her fate as a beautiful but anonymous courtesan was sealed. Her bond was purchased by the nobleman Anafiel Delauney, who recognized the scarlet mote in Phedre's eye as the rare mark of one touched by a powerful deity. Under Delauney's patronage she is trained in history, politics, language, and the use of body and mind as the ultimate weapon of subterfuge in a dangerous game of courtly intrigue. Guided into the bed chambers of Terre D'Ange's most influential nobles, Phedre uncovers a conspiracy against the throne so vast that even her teacher cannot see the whole of it. As her nation is besieged by invading hordes from the north, the most unthinkable threat to her beloved home comes from traitors within. Betrayed and blindsided by her own longings, only Phedre and her trusted bodyguard Josselin are left to cross borders and warring armies in a race to stop the final blow from falling. Will you be reading Kushiel's Dart along with us? Have you ever read this series?